The Wizard is a pure spellcaster, harnessing arcane and elemental magic to do his/her bidding via a devastating array of offensive spells. 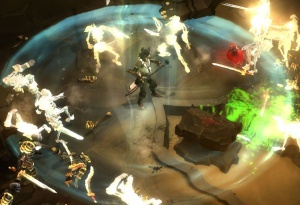 While the Wizard is thought to be quite similar to the Sorcerer and Sorceress of previous Diablo games in design, the play style is quite different. Diablo 3's end game Wizard play puts a much greater emphasis on defensive skills and crowd control spells, and has much less movement speed due to the cooldown limitations on teleport. Other major gameplay differences stem from equipment changes (weapon damage and Critical hit Chance / Critical hit Damage matter for all classes), the removal of skill points, and especially the fact that monsters do not have varying resistances to different types of elemental damage. The resource system, Arcane Power differs greatly as well. AP refills very quickly, and Wizard skills use both AP cost and cooldown time as limiting factors. Both can be circumvented by other skills and item affixes. The "Arcane Power on Crit" ("APoC") affix is a build-changer for most end game wizards. The Wizard is a fast-action, fast-casting, primarily-ranged attacker. The class is not really a "glass cannon," despite having a Passive skill actuall called Glass Cannon. In fact, that is one of the main complaints about the class; that they are more of a mage tank than anything else, who must rely on defensive skills or strong crowd control and enemy debuffs to survive. See the Wizard skills page for a full list of all Wizard skills and rune effects. As with all classes, the skills are sorted into six categories. Enabling Elective Mode in the Game Options allows players to choose any skills from any category, rather than being stuck with one from each in the default, noob-friendly design. Refer to Diablo3Ladders.com for a listing of all Wizard passive skills ranked by popularity. Male Wizard using Wave of Force. See the Wizard passive skills article for a full listing with descriptions and more details. These skills focus more on utility, variety, and defense than on boosts to the Wizard's offensive attacks or damage. By far the most used and most build-changing passive is Critical Mass which grants critical hits a chance to reduce the cooldown of Wizard skills by 1 second. Numerous Wizard builds rely entirely on "CM" in order to repeatedly use skills with 6, 8, 10 second, or even longer cooldowns. Blizzard has adjusted (lowered) the proc coefficient values of numerous Wizard skills several times since launch, since some skills (especially Energy Twister) that caused many, many hit checks were procing so often that Critical Mass was triggering almost constantly and effectively reducing cooldowns to nothing. During early design passive skills were called "traits" and were set to allow 1-5 points to be spent in each. This system was scrapped and simplified shortly before the beta test began. See the Wizard traits page for full info on what the traits system looked like. Like all of the characters in Diablo 3, the Wizard has a unique in-game backstory that gives insight into the character's personality and mannerisms. The male and female versions of each class are essentially interchangeable in these non-gendered fictions. The Diablo III Wizard hails from the far northern island of Xiansai, which lies in a region culturally and ethnically similar to Asia. The Wizards are anything but aged Dumbledore types; in the game fiction the Wizards (male and female) are portrayed as rebellious, impudent, headstrong, and cocky young mages who were too impatient to follow the rules and wait to learn slowly from the elders at the mage academy in Caldeum. Abd al-Hazir, the scholar and historian responsible for most of the in-game lore released pre-game, wrote about the wizard's time in a mage academy in Caldeum in his seventh entry. Although there is no truth to the tales that she actually ventured into the infamous Bitter Depths below the Sanctum, she was caught in the Ancient Repositories, where the most dangerous incantations are housed for the safety of the public. When confronted by the great Vizjerei mage Valthek and demanded to account for herself, she brazenly attacked him rather than face the punishment merited by her acts. Exaggerated stories of the battle are already being inflated to mythic proportions by the more rebellious of our city's youth, but suffice it to say that she did not actually best Yshari's most powerful mage in single, honorable combat. The details of the encounter remain unclear, as Valthek has yet to regain consciousness, but it has been verified by reliable sources that she relied on trickery and deceit to bring the great man low. I have also been assured that the extensive property damage was chiefly the result of Valthek's magical prowess, not the upstart wizard's. As to where she is now, no one rightly knows, for she fled the city immediately after the encounter. This story built fan expectations that the Wizard would be quite unruly and reckless. Unfortunately, those character traits do not really come through in the game, and even when the game action moves to Caldeum in Act Two, the Wizard does not show any concern or heightened attention in returning to that city. Female wizard: concept art to final in-game. The female wizard's appearance was widely-accepted and non-controversial. She looks quite a bit like her original concept art. The primary complaints were that he looked too effeminate, and while there was arguably a homophobic edge to the complaints, the class design was more metrosexual and less masculine than some fans were expecting. People especially hated his "starfish" hat. Male Wizard gear set, October 13, 2010, set off the biggest debate of all, about his huge "starfish" hat. Many fan complaints and revisions of his starfish hat. And yet more fan remakes. A vote found very mixed opinions about the helm, in contrast to the overwhelmingly negative fan comments. Male Wizard concept vs. in-game. Blizzard made no substantive comments over the fan reaction to the male wizard's appearance and if the character changes any in appearance during the rest of the development cycle, no one noticed. 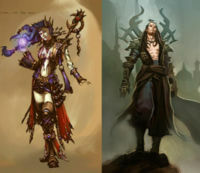 A poll on Diablo.IncGamers.com found fan opinions widely split on the character's look. What do you think of the look of the Male Wizard? 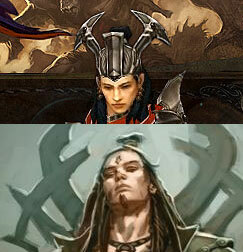 This entire controversy stemmed from the look of the character in some artwork and renders; no one objected to the look when playing him in the BlizzCon 2009 demo. That trend continued, and the controversy did not reappear when the beta test began and the look of the character is a non-issue post-release. Some fans initially criticized the Wizard for just being the Sorceress with a new look. Jay Wilson commented on that in an interview with 1up.com in December 2008. Jay Wilson: "I would respond, "Yeah, you're right; the Wizard is basically a re-skinned Sorceress." What we couldn't do with the Sorceress very well was break into what I'd call the old-school pen-and-paper magic user. You know the old magic user who could do a variety of things, like conjure up animals out of midair or create clouds of fog and acid or control time or disintegrate things or use death spells. They had this wide variety of magic that they could use compared to the more traditional elementalist -- which is what the Sorceress is, meaning fire, ice, and lightning -- who was just more limited. What we really wanted to do is break into this area, while if we just did the Sorceress again, we'd be like, "OK, you have to do fire, ice, and lightning, but where does Disintegrate fit? Where does Slow Time fit in?" So we decided [that we'd] just take the same class mechanics, and [that we'd] change the basic concept and name and just have a throwback to that old-school magic user to give ourselves a broader range of magic skills. But there was never a huge desire to go away from the basic gameplay of the Sorceress; there's a lot of repeated skills, and that's intentional." One major change from Diablo 2, seen during the development cycle, was the addition of spell damage item affixes. Unlike the skill point system in Diablo 1 and Diablo 2, Diablo 3 had no skill points, and thus weapon damage became as important for mages as for combat classes. The developers made this change partially to even out the classes, after the Sorceress and Necromancer were extremely good at Magic Find in Diablo 2 since they did not need to worry about boosting damage with equipment. (Just boosting skill level.) This allowed those characters to stack up much more Magic Find and Resistance on their gear, while still retaining a rapid killing speed. I found numerous wands, staves, and even pieces of armor with values between +5-25% spell damage, and that was just in the early stages of the game. That system did not survive through to launch, and after further experimentation the Wizard and Witch Doctor were slotted into the same pool of affixes and weapon functions that the other three classes got. This made the game more accessible and consistent across the classes, but it's not a universally-popular design with many fans wishing the spell casters had different priorities in equipment and affixes than the combat characters. 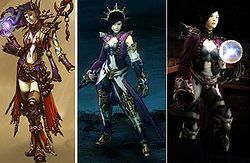 The Wizard was the third class to be revealed, making her debut at BlizzCon 2008, several months after the game's initial reveal in June at the Paris WWI. Later in development Blizzard admitted that the Barbarian and Wizard were by far the most polished classes at launch. Despite that they chose to debut with the Barbarian and Witch Doctor since the WD was more of an original character type. This was a mixed blessing since many fans were unhappy that the Necromancer was not coming back, but when the Wizard debuted just months later, the class was clearly far more developed than the WD, with many more functional skills. The Wizard's resource took longer to nail down. The class used Mana as a placeholder resource in the Blizzcon 2008 and 2009 demos, even after Blizzard had announced, in late 2009, that Mana was not going to be the final version of the class' resource. The system evolved further over the next couple of years, with Instability the resource for a time, until Arcane Power was implemented and perfected. The female Wizard is voiced by Grey DeLisle, a veteran of voice acting. She's done many film and television roles, including Azula from Avatar: The Last Airbender, and roles in Afro Samurai, The Spectacular Spider-Man, Wolverine and the X-Men, and many more. She's also had many roles in video games, including a lot of the Star Wars series, Mass Effect, Metal Gear Solid, Baldur's Gate, Fallout, Doom 3, Batman: Arkham City (as Catwoman/Selina Kyle), and she also played Nova in StarCraft II. The male Wizard is voiced by Crispin Freeman, also a veteran voice actor. He's done a gluttonous amount of English dubs for anime, and also many video games including the .hack series, BioShock 2, God of War III, Metal Gear Solid 4, Xenosaga, Saints Row: The Third, and many more. Slow Time with Wave of Force to throw spells back at casters. Casting Electrocute out of a Slow Time bubble. Mana Globe in a level-up explosion. The male Wizard in the game. Male Wizard concept by Glowei. This page was last edited on 8 June 2017, at 04:10.